44 Inch Arc Personalized Totes 3 Fold Auto Open/Close Umbrellas are presented in Black, Red, Blue, and Navy color choices. These custom auto close/open umbrellas make it hassle-free to enter and exit vehicles, and also home or workplace with their auto open/close button. The ergonomic handle provides secure and comfortable grip whereas the carrying strap delivers the required convenience. Utilize the 5.00" H x 6.00" W imprint area to make your brand logo popular. Order these custom umbrellas right away to get the free custom design and free digital proofs facilities. 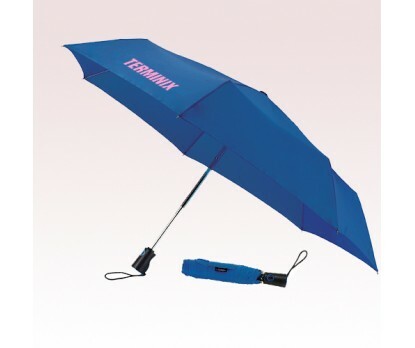 Request a quote to know the value savings that you can avail on bulk orders of 44 Inch Arc Personalized Totes 3 Fold Auto Open/Close Umbrellas.